It has been calculated by some savants, by the late Dr. Kenealy in particular, that a Messiah, or divine teacher, has been sent to the world every 600 years. The Naros was always held to be a secret cycle, there being at least one good reason for the secrecy, for, were it commonly known that a messenger came every 600 years, how many impostors would there be at this time approached? It is interesting that in 1137 there was a Messiah, a pretender in France, and another in Persia. 1137 is very near to 1098, (marked St. Bernard on the diagram). The Phoenix, though an excellent symbol for any cycle, has been especially associated with the Naros. Dr. Kenealy in his The Book of God, states that the ancient Irish ascribed a longevity of 600 years to their Phoenix, that Ovid and Herodotus mention it and say that it makes its appearance every 600 years. In Chaldee and Coptic it is called Phennische; these letters used as numbers add up to 600. The coming of a Messiah is, of course, associated with the Annunciation. The spray of Lilies, which in the old pictures of the Annunciation, Gabriel presents to the Virgin, shows each lily as having six leaves and each flower six petals. This spray of lilies, typifying fire and water, or the idea of creation and generation, symbolizes precisely the same idea as the Lotus in the hand of the Bodhisattva who announces to Maha-Maya, Gautama's Mother, the birth of the world's Savior, Buddha (See S. D. I, p. 379, f. n.). In the Sixth Century a. d. a certain scholarly monk, Dionysius Exiguus, calculated the date of the birth of Christ, and proposed that thenceforth all things should date as from that date. This proposal met with some opposition at first, but eventually its supporters, the Venerable Bede among them, carried the day. We are now told that the occult date of the birth of Jesus is 102, or 103 years earlier than the date set by Dionysius. Considering that modern scholars have been unable to discover any reliable information about the birth of Jesus, it must be admitted that Dionysius came pretty near to the truth. Taking 102 b. c. as the birth of Jesus, it is a simple matter to keep adding 600 years and thus arrive at dates when messengers should appear. I was encouraged to pursue this study because of two statements to be found in Theosophical literature that quite evidently support the idea that Messengers are sent every 600 years. In The Ocean of Theosophy (p. 178) we find the statement that the Kali-Yuga commenced with the death of Krishna, 3102 b. c. That is 3000 years from 102 b. c, or five periods of 600 years. The second statement is to be found in H. P. B. 's Glossary, under "Eleusinian Mysteries": "Epiphanius traces them to the days of Inachos (1800 b. c). founded, as another version has it, by Eumolpus, a king of Thrace and a hierophant." Again, three periods of 600 years. Also, I have noticed a disposition to use the expression, eighteen-hundred years ago, when comparing our own times with those at about the beginning of our era. (See Studies in Occultism, No. V, p. 253). The affairs of men are the manifestations of the thoughts of men; and the thoughts of men follow three distinct and separately characteristic types, as history demonstrates. They are: a religious era, always followed by a scientific era, invariably followed by a philosophical era, which ushers in again a religious era, which gives way in its turn to a scientific era, followed again by a philosophical era; and thus the wheel of life turns continuously around. 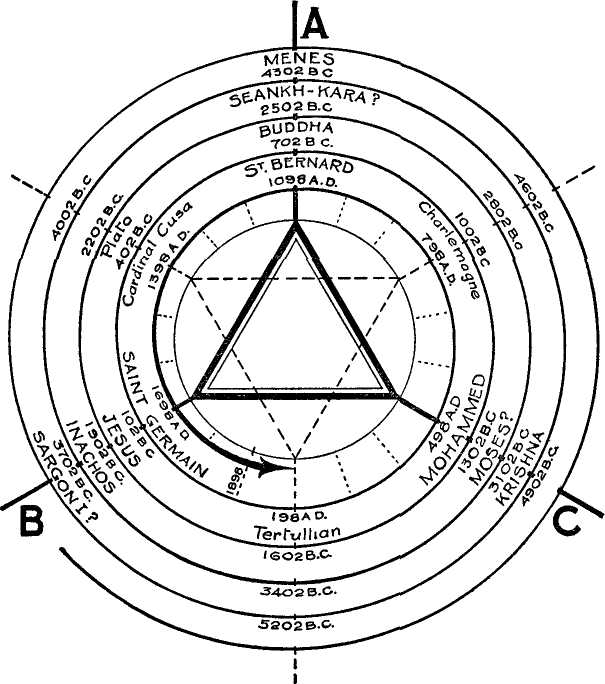 so that if the student desires to trace these changes for the Messianic Cycle beginning with Buddha, for instance, then the point of the triangle at "A" should be considered as marking the Scientific period of the people to whom Buddha came. For the purpose of a diagram to be used for a lecture, the interlaced triangles could be drawn on a movable disc and marked Religious, Scientific and Philosophical at the corners of the dark triangle. With the aid of such a device, some very interesting points could be readily brought out; for example, if the word Scientific were placed opposite "Buddha," then the diagram would show that the point marked Religious came opposite to the point marked "Mohammed." 498 a. d. is an important date in the history of Buddhism, as we shall see. It should be pointed out that in the case of many of the names shown on the diagram, the exact date of birth cannot be ascertained, for instance, there are four dates for the birth of Buddha and they vary as much as 103 years. If any presently accepted date falls within a period including the fifty years before and the fifty years after our theoretical date it is as close as we can hope to come. Now let us trace these dates backward, beginning with 102 b. c. The first date is 702 b. c. This is a wonderful date, for about this time we have Gautama Buddha in India, Lao-Tse and Confucius in China, Numa Pompilius in Italy, and Isaiah in Palestine. Curiously enough, on Feb. 11 of this year, 1940, the Japanese celebrated the two-thousand six-hundredth anniversary of the birth of their first Emperor Jimmu. According to this, the Emperor was born on Feb. 11, 661 b. c.
1902 b. c. we have already touched upon; on the authority of H. P. B. this point is marked Inachos. 2502 b. c, Dr. Kenealy gives Zoroaster for this date, but it cannot be verified. H. P. B., in her Glossary, points out that the dates vary from 6000 years before the time of Plato, to 1000 b. c. Neither of these dates help very much. In Tabular Views of Universal History, by Putman, there is this item: "2500 b. c, Reign of Seankh-kara, who dispatched an expedition to the land of Punt for Spices." You may ask, is one warranted in picking out a name of a king simply because he reigned at the required time? Well, of course, it is easy to make a mistake, but if you are considering a time prior to the Sixth Century b. c. you are not likely to be far wrong; for H. P. B. (S. D., "Vol. III"), in speaking of Egypt, says, "It was Amasis, 570 b. c, who destroyed the priestly power and thus perished the ancient Theocracy." In other words, kings up to that time had been priest-kings, or Initiate-Kings. About 1800 years before Seankh-kara, Menes reigned in Egypt. W. Q. Judge places Menes among the Avataras, from which we may infer that Seankh-kara was also an Avatara; for our diagram shows that history repeats itself every 1800 years in any one nation or people. Between Zoroaster, the primeval institutor of "Sun" worship, and Zarathushtra, the primeval expounder of the occult properties and transcendental powers of the divine (Promethean) Fire, there lies the abyss of ages. The latter was one of the earliest hierophants, . . . while . . . Bunsen places Zoroaster at Baktria and the emigration of the Baktrians to the Indus at 3784 b. c.
The above illustrates the difficulty that confronts those who essay to fix dates; however, we may include Zoroaster of Baktria in our list for if he were living in 3784 he must have been born very near our date of 3702 b. c. 4302 b. c. — Budge gives the date of Menes as 4400 b. c, and describes him as the first king of United Egypt; and as W. Q. Judge includes him among the Avataras, we may accept this name as fairly certain. (See The Ocean of Theosophy, p. 169). In these cycles we can include mixed characters who have had great influence on nations, such as King Arthur, Pharaoh, Moses, Charlemagne reincarnated as Napoleon Bonaparte, Clovis of France reborn as Emperor Frederic III of Germany, and Washington, the first President of the United States of America, where the root for the new race is being formed. Napoleon, according to the Memoirs of Prince Talleyrand, believed himself to be a reincarnation of Charlemagne, (W. Q. Judge, Op. Cit., p. 86). The time from Charlemagne to Napoleon is 1018 years; from Clovis to Emperor Frederic III is 1300 years. Concerning the Messengers in our own era, first there is Mohammed, 498 a. d., whom W. Q. Judge in speaking of Avataras, describes as "a minor intermediate one for a certain part of the race." The accepted dates for the life of Mohammed are 570-632, but even here there is some uncertainty, for the date of his birth is an a priori combination; thus ten years is allowed for the Mecca period; ten years for the Medina period; three years of secret work at the beginning, to which is added forty years, because citizens of Mecca did not become full citizens until they were forty years old. But who knows whether he was actually that age? Before Mohimmet's time Arabian paganism had already been attacked both from the outside and from the inside. On the one hand the Northern tribes had gradually been christianized, owing to the influence of the Byzantine Empire, on the other hand South Arabia had fallen successively under Jewish, Abyssinian and Persian influence. . . . .Christianity had some important representation in Najran far south of Mecca . . . Mecca itself and the neighbouring and allied Taif are said to have produced some monotheists or Christians we even hear of flagellant monks and persons vowed to a life of total abstinence among precursors of Islam. So far as Mohammet may be said to have formulated a definite notion of his work, we should probably be right in thinking it to be the restoration of the religion of Abraham, . . . and there are stories, not necessarily apocryphal, of precursors of Mohammet going abroad in search of the "Religion of Abraham." . . . The precursors however, appear to have felt no call to reform their fellow-citizens, whereas, it is evident that Mohammet regarded himself as charged with a message. The above citations point to a pre-Islamic movement. This was possibly due to the zeal of some missionary from among the Copts of Egypt or Abyssinia; if so, it would account for the fact that "the Prophet Mohammet himself had prescribed indulgence to the Copts before his death. Amrus, the Arab conqueror of Egypt, was mercifully disposed to the Copts." For a. d. 1098, Dr. Kenealy gives Jenghiz Khan. His historical dates are 1162-1227. One hesitates to put Jenghiz Khan in the same category as Menes, Buddha, and Jesus, not to mention other honored names; for generally he is looked upon as a hideous character, a combination of acute generalship coupled with a callous delight in butchery. In the West, at any rate, it seems to the writer that Bernard of Clairvaux has more title to be included in a list of Messengers than Jenghiz Khan. He was born in 1091, within several years of our date. He it was who may indeed be said to have carried on the work started by the Avatara Jesus, and his influence on succeeding centuries was very great. About this time we also note St. Francis of Assisi, El Cid in Spain, St. Ladislav in Hungary, and the leaders of the First Crusade. The Count de Saint-Germain — 1710-1789; these are the dates generally given, but it is admitted that nobody really knows when he was born or when he died (if he did die?). The Theosophist for July, 1905, has an article by H. S. Olcott entitled "The Count de Saint-Germain and H. P. B., Two Messengers of the White Lodge." This is published as a pamphlet by the Adyar Society. The point of interest for our study is that he did no public teaching, as H. P. B. was evidently sent to do. Saint-Germain is regarded as an important figure in the early activities of Freemasonry, though efforts have been made to discredit his masonic affiliations. However, the memoirs of Cagliostro contain the statement that he was initiated into the Order of the Knights Templars by Saint-Germain, and the fact remains that Masonry, in its present form, came into being during the life of Saint-Germain. That he did no public teaching, and that he worked among the secret societies seems to parallel the statement made concerning Jesus, i. e., that he came but to the "lost sheep of Israel." Jesus was followed by Apollonius of Tyana and others, and Saint-Germain was followed by H. P. B. and others. Concerning the names at the points of the dotted triangle: 198 a. d., we have the Church Fathers, Tertullian and Clement of Alexandria. 798 a. d., Charlemagne, and 1800 years before that we have 1002 b. c, said to be the time of the first appearance of the Homeric poems. It is interesting to note that there is also a wealth of legendary stories clustering around the name of Charlemagne, and these stories or legends were not new. They resemble the Arthurian legends, just as the Homeric stories have their counterpart in the Mahabharata. These are a method of teaching and of preserving the Ancient Wisdom in a manner best suited to the times. In 1398 a. d. Nicholas of Cusa, or Cardinal de Cusa, H. P. B. tells us (The Secret Doctrine, "Vol. III") reincarnated almost immediately as Copernicus, in order to carry on important scientific research. Other names are Huss, Chaucer, and Thomas a Kempis, whose Imitation of Christ is the world's second-best seller. This point also marks the beginning of the Renaissance, and the coming of the great reformer of Buddhism, Tsong-Ka-Pa (1356-1418). In 402 b. c, or 1800 years later than the last date, we have Plato, who marks the beginning of the renaissance of scientific thinking in the Grecian world, ending in the materialism of Rome — just as our renaissance is ending in the materialism of our time. It would be a mistake to suppose that these periodic changes are caused by the coming of one of the Messengers; it would be better to think of the Messengers as coming, or being sent to guide a certain portion of mankind through the changing conditions that confront that particular portion of mankind. Other and important events mark these cyclical times. We have already noted the important happenings of a. d. 498, or the point marked "Mohammed" on the diagram. Let us examine some of the other dates. 102 b. c. is the occult date of the birth of Jesus, but it is also the date of the birth of Julius Caesar; also, it is about the date of the removal of the libraries of Athens to Rome and the political end of Greece. 3102 b. c. is the death of Krishna, but it is also the beginning of the Kali-Yuga, and also marks the time when a number of the planets were in syzygy, as they will be again early in May, 1941. Let us again look at the date 702 b. c. In Greece this is the beginning of the Hellenic period, a period that includes all the principal temples and monuments erected between 700 b. c. and 146 b. c. (or the fall of Corinth) — though her greatest masterpieces belong to a short period commencing some 200 years after 700 b. c. According to our theory that history repeats itself every 1800 years, we should expect to find a similar condition arising in the Christian era beginning with 1098 a. d. but with its greatest masterpieces belonging to a short period commencing some 200 years after 1098 a. d. which is exactly what we find to be the case. The present writer holds that the achievements of the 13th and 14th centuries are in every way comparable with the achievements of the high water mark of the Hellenic period, furthermore, speaking as an architect, he makes bold to assert that in architecture the work of the 13th and 14th centuries far surpasses that of the Hellenic period — and why not? Are we not told that the European family race has been steadily rising since the downfall of the Western Roman Empire? In some quarters it is the fashion to see no good in anything relating to the Christian era. We read that 1800 years ago some of the adherents of the Christian cult (the Theosophists in those days) were just as complacent and critical as some are today — H. P. B. gives us the reason for this state of affairs. In his Unveiled, Vol. I, p. 34, she writes: "An age of great inspiration and unconscious productiveness is invariably followed by an age of criticism and consciousness. The one affords material for the analyzing and critical intellect of the other." It will not be difficult for the student of the history of art and architecture to decide whether the high-water mark of the Hellenic period in Greece and the thirteenth and fourteenth centuries in Europe are "periods of great inspiration and unconscious productiveness." There are some modern writers on art and literature who have compared the splendid achievement of the two periods, and this study of the law of cycles certainly appears to confirm their findings for students of Theosophy. It appears that a religion reaches its high-water mark about 1300 years after the coming of the Messenger who inspired it, and, as we have already shown this is also the time of the greatest achievement in art and architecture. Asanga, a monk of Gandhara, about 500 a. d. played a role of fateful consequences. He brought in the theory of the union of the individual with the Spirit of the Universe from Brahmanism and thus prepared the way for tantrism. The final decadence of the Mahayana Buddhism took place in the Seventh century a. d., when Sivaistic Mysteries entered. To the Gods were assigned women companions, numberless demons and patrons were adopted, and in that way the framework of the structure of present-day northern Buddhism was constructed. This mixture of religions was preached for the first time in Tibet about 640 a. d. . . . King Thi-Sron-Detsan summoned Guru Padma-Sambhava from India in 747 a. d. and he became the actual founder of Lamaism. The monastic life in Tibet had fallen into decay, celibacy was a dead letter and the religious rites were merely practices of magic. At that time, early in the Fifteenth century, the great reformer Tsong-Ka-Pa appeared and founded a new sect that outstripped all the others and has become the state religion that yet obtains. This last statement is very interesting; for Tsong-Ka-Pa was born in 1356 a. d., a little over 2000 years after the birth of Buddha; the messianic cycle had then run its course and Buddhism took on a new life. It is a little over 2000 years since the birth of Jesus. Will Christianity take on a new life? — At any rate the state of Christendom compares favorably with the state of the Buddhist world at the time of the coming of Tsong-Ka-Pa. The present writer believes, with many others, that Christianity has already begun to take on a new life and consequently believes that one of the best ways of spreading Theosophy would be to assist in that re-statement of Christian doctrine that Christian leaders now say is called for, and towards which definite steps have already been taken within the Church itself. The publication of "The Report of the Archbishops" Commission on the Doctrine of the Church of England" is a case in point, not to mention a steady stream of new books of a very liberal character, prominent among which, Essential Christianity, by Angus, should be mentioned. The working out of this diagram has been a great help to the writer, and he hopes that it may be of use to other students. A pattern appears in history; odd statements and dates may be fitted into it. The key to it all is the constant change that we have been studying. If, as at present, things seem to be crumbling, we may say "This too will pass" and know at the same time, that history warrants the statement. Before leaving this part of our study, let us see what may be deduced therefrom. First that there is continuity and order in the affairs of men. Secondly, that there is no need to be dismayed and to talk about the downfall of civilization, for somewhat similar conditions prevailed 1800 years ago, and will prevail again 1800 years hence; 1800 years ago, that is 140 a. d., Rome was at its zenith; Antoninus Pius was Emperor, and there were wars, of course. Thirdly, that Christian people do not need to be disturbed by the fact that our scholars say that no authoritative historical records of the birth of Jesus are to be found. A student of Theosophy is taught that he did indeed live and teach and that the time and place of his coming were known to those entitled to know. He came but to the "lost sheep of Israel," i. e., his work was among the few who were ready. Probably small groups were formed who avoided public attention at that time, but who, nevertheless, paved the way for those who should take up the more open work later, such as Apollonius of Tyana, Paul and others. And that is one reason why there are no historical records to be found. Neither shall we be disturbed to contemplate the fact that Jesus was one of a long line of glorious Messengers and Saviors. This does not diminish the majesty and beauty of his character; rather, in knowing that all men in all times have had their "Sons of God" to teach and to inspire them, we shall take more joy in Christianity.